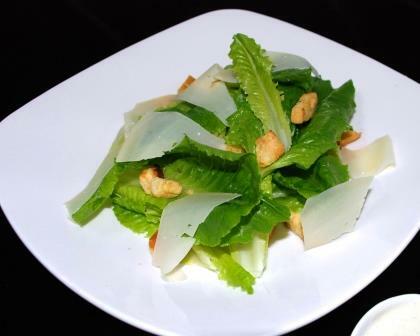 History: This popular salad was created in 1924 by Chef Caesar Cardani. It was prepared and served right at the table in his restaurant in Tijuana, Mexico. The original recipe did not use anchovies and in the recipe here we will used coddled eggs, not raw. A coddled egg is cooked for about 45 seconds to 1 minute in boiling water. It gives the dressing a smoother, creamier consistency. 1/2 Head of baby Romaine Lettuce leaves. In a very large wooden bowl mash together the garlic & anchovies until smooth. Add the romaine, croutons and rest of parmesan. Add extra ground pepper if desired.